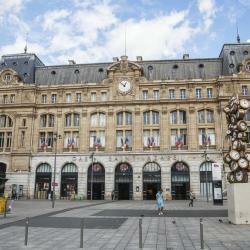 Looking for hotels near Musee de l'Homme? Passy Eiffel is less than half a mile from Trocadéro, which offers the best views of the Eiffel Tower. It offers 3-star accommodations in one of Paris’ quiet streets. Offering free WiFi throughout, Le Narcisse Blanc & Spa is located in Paris, in the 7th district. Invalides and Tour-Maubourg Metro Stations are a 5-minute walk from the property. Room was beautiful with high ceilings and modern decorations. Very comfortable. On the prestigious Avenue Montaigne in Paris, Hôtel Plaza Athénée is a luxury palace with a Dior Institute spa, 5 restaurants, a cocktail bar and a seasonal ice-skating rink. The hotel is of course a dream but what made our stay so exceptional was the friendly staff. Hotels with great access to Musee de l'Homme! This 4-star hotel features a tremendous location, within a stone’s throw of the Champs-Élysées and the Eiffel Tower. Free WiFi access is provided throughout the property. The location is great - so close to the eiffel tower. And it's not far from the metro. Vestay George V is set in Paris, 1640 feet from Champs-Elysées Avenue and features rooms with free WiFi and a balcony. Location is absolutely perfect. Located a 5-minute walk from the Champs Elysées, this 19th-century boutique hotel features original works of arts in each room. It provides a 24-hour reception and an airport shuttle service. Everything was great, staff are lovely and everyone is always smiling. Located in the chic 8th district in central Paris, this 19th-century style hotel offers elegant guest rooms overlooking a flowery interior patio. It features a tour desk and ticket service. People were very nice. When we arrived we got An upgrade. The ambiance and location are perfect.